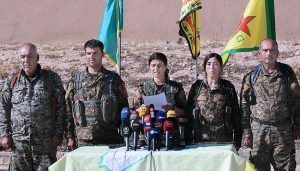 Jehan Sheikh Amad, Spokeswoman of the Syria Democratic Forces (SDF) announced Sunday the beginning of the rebel group’s offensive on ISIS-held Raqqa in a campaign baptized the “Wrath of the Euphrates” while hoping that Turkey would not “interfere in internal Syrian affairs”. 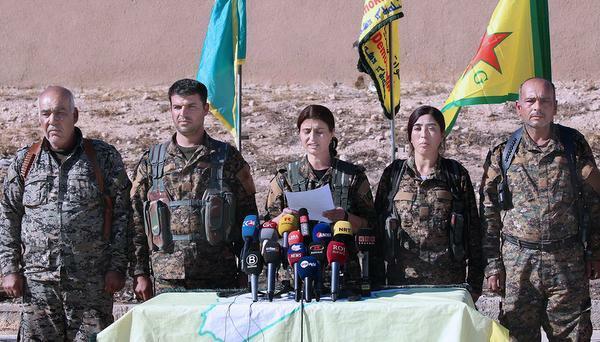 SDF is an alliance of Kurdish Popular Protection Units (YPG) militia and other ethnic Arab militia groups but there have been fierce fighting between some of its components. The Kurds are the dominant force but Turkey has repeatedly stated its opposition to the group that it considers a terrorist organization. Raqqa has served as ISIS headquarters in Syria and has around 5,000 militant fighters. Battling the extremist group out of the city is expected to last for several weeks given that the offensive on Mosul in Iraq is heading towards its fourth week and the Iraqi forces are yet to enter the city. The rebel forces in Syria as well as the coalition do not have the support of the Assad regime and Turkey also has its allies and foes among the Syrian rebel groups. British Defense Secretary, Sir Michael Fallon, cautiously stated that their air force “will support the Raqqa operation as it develops” while France has ruled out sending ground troops. The US has warned that only rebel forces of ethnic Arabs from around Raqqa, not Kurdish fighters, will enter the city because “we want a force that ultimately liberates Raqqa that is primarily from the local area.” Kurds have been accused in the past of abusing Sunnis when they free them from the extremist group. The government in Damascus is yet to comment on the development. Written by: Jaber Ali on November 7, 2016. Posted by Jaber Ali on Nov 7 2016. Filed under Gulf News, Headlines. You can follow any responses to this entry through the RSS 2.0. Both comments and pings are currently closed.